Here’s what’s to come for 2016…and even 2017! This past year was quite a year. After five months of hiking 2000mi (on the Hayduke Trail, Tahoe Rim Trail, Lost Coast Trail, a section of the CDT, and the Great Divide Trail) I returned home to Portland, OR in September ready for a break from hiking and blogging for awhile. I have been doing presentations about this year’s hikes, but I’ve mainly been working. For those that don’t already know, I’m able to afford 5 months or more of hiking each year through simple living and working 60+hrs a week substitute teaching and nannying/babysitting during out of school hours. It is tiring, and quite the imbalance that leaves little time/energy for much else, but it’s worth it to be able to travel so much each year. I’m very fortunate that all has fallen into place to seamlessly make this lifestyle possible and I want to take advantage of it while I can physically and financially. For me, sharing the journey is all part of keeping things in balance. Being out on the trail gives me so much, that I want to pay it forward in some way, and the blogging is my way of contributing. This is going to be quite the year (and a half!) ahead, so here’s the general timeline. I’ll explain each venture briefly now, with more detail to come on why I’ve chosen each of these and more details of terrain and strategy in future posts. **The 2016 hikes I’ve chosen are high routes that are largely weather and snowpack dependent. The dates I give below are ideal time frames that may need to be shifted (or even postponed to another year) if snowpack is too high this year. I’m very flexible and am completely entertained by local Northwest hikes if conditions are not safe to head out to high elevation earlier in the summer. Here’s the basic reasoning in all of this. I will go into more detail in future posts. I seriously had no idea what I wanted to hike in the future when I returned home after this past season. I took some time to think about it and wanted to just go with my gut. I’ve had New Zealand on my radar for years and I’ve been waiting for when it felt right to go. Since New Zealand has opposite seasons from the US, I’ll be hiking there during the US fall/winter. I’ve chosen to work through the whole school year this year to make as much money as possible for the overseas hiking (plus the fact that I’ll miss most of the school year next year while I’m gone). I’m completely content with the extended time at home this year. I have been craving some “nesting time” and a break from the planning, blogging, and endurance of long distance hiking. That opened up a window for me to do hiking during the summer months that most years, I would’t be able to do. Some of the more challenging (mentally and physically) high routes that are shorter miles, but still require a good chunk of time given that mileage will be much lower on those mainly off trail routes. These summer hikes will be another step up for me in challenge and I’m interested to see if I enjoy them and the more tedious terrain of these hikes that are mostly off trail. Are You Hiking With Anyone? Rockin’, Why Not, and myself on the Tahoe Rim Trail. I’m soooo STOKED to announce that I’ve convinced my good friends Rockin’ and Why Not to join me for the summer!!! We all did the Tahoe Rim Trail together last summer and I love the power and inspiration of hiking with them. The trio reunites! Rockin’s a teacher and has til early August to squeeze in the SHR and WRHR. For those of you that don’t know, Rockin’ is my friend and mentor that I’ve done many hikes with since we met in 2011(when I was preparing for my first thru-hike of the PCT). She is also a committed and well known backpacking blogger with the site, ladyonarock.com. The Sierra is Rockin’s backyard playground and she’s a big fan of climbing on all the jagged rocks out there (hence the name Rockin’). Rockin’s enthusiasm for the Sierra is sure to be a boost in such difficult terrain. Why Not is awesome and is in for possibly all three high routes I hope to do! Why Not just returned from the Te Araroa in NZ, which I plan to hike later this year, and also keeps a daily blog I love. I’ve consistently been following in Why Not’s footsteps for years and I’m excited we will have a whole summer to hike together. The three of us are going to have a lot of fun doing these together. As for AUS and NZ, I plan to do those solo. There are many other hikers out there and I’m looking forward to doing my own thing as I usually do on the really long hikes. Most people are familiar with the John Muir Trail in the Sierra. The Sierra High Route is 195mi and should take about three weeks to complete. It basically parallels the JMT (overlapping for short stretches), is mostly off trail, over talus, and above tree line. This route is not new and was published by Steve Roper in 1997. Although it’s been around for decades, few seek out such remote areas, so there will be a great deal of solitude along the route. Rockin’ has hiked pretty much all of the SHR in pieces on trips mostly a decade or more ago, and has been itching to do a complete thru hike of the whole thing. This route has maybe 1/3 of the miles as trail, but the rest will be very taxing and cautious hiking on talus. That jagged, loose, and unforgiving rock is my biggest concern on this route with my trick ankle. Many times, I said I’d never hike this route and that I had no interest. After gaining more confidence on the rocks along the Appalachian Trail and then the scrambling on the Hayduke Trail, I have found that this is one challenge I have evolved to find interesting. I don’t know that I’ll love it…or even like it…but I want to give it a try. Rockin’ already knows she loves it and that will be just the right kind of energy I’ll need for something I find intimidating. I have friends that have hiked the SHR and it is quite different from most thru hikes. The conditions and terrain will vary from moment to moment with an average of ~10-15mi/day most days. The plan is to enjoy this one as much as possible by not trying to push mileage. We all have time and are in no rush, so we have the flexibility to adjust where needed. Just to give and idea of the talus we have in store for us, here is a picture Rockin’ on one of her trips along the SHR. Rockin’ on the Sierra High Route talus. The Sierra is a magical place for many and I think this is an experience worth putting time into. Few others will be out there and I look forward to the solitude and having much of the trip to ourselves. Yes, there may be a lot of snow this year, and that will dictate our decision on when we’ll go, but the hope is by late June. All of us are familiar with Sierra snow and actually enjoy some snow on those mountains…especially if it makes for smoother travel over talus, ha! For many, grasping the concept of these high routes and where they go, can be difficult. For all these routes, I thought making a GoogleEarth virtual tour would be a fun way for me to get more comfortable with the navigation. I think everyone will really enjoy these. A great big THANK YOU to my friend GoalTech for teaching me how to make these virtual tours. Love it! I used the maps and points from Andrew Skurka’s SHR mapset, which is based off of Roper’s original route and guidebook to plot the route and create this virtual tour. If you’re on a smart device, you may not be able to view the embedded video below, so click here to view the Sierra High Route Virtual Tour. This tour takes the route from south to north (it can be done either way). Yes, there is a track there to guide the viewer’s eye, but remember that this is a route and there is no exact trail to follow. Note that the GoogleEarth image is from May 30, 2014 as a reference. I’ve been making plans to return to the Wind River Range ever since I hiked through the Winds along the Continental Divide Trail in 2013. The flowers and green grass of the alpine lakes and meadows are unique and different from the gray kind of monotone the high Sierra can have. It is one of my all time favorite places I’ve hiked through. There are many high routes through the Winds. A very popular one is the route created by Alan Dixon and Don Wilson. It is about 80mi, and just like the SHR, goes off trail over passes along talus for a decent portion of the hike. Dixon and Wilson believe that the WRHR is “mile for mile the finest non technical Alpine route in North America.” Of all I have planned for this summer, I’m most excited about this route! In the Wind River Range on the CDT. The WRHR will pose much of the same challenges as the SHR and it will also be low mileage days. The Winds can have heavy storms and should still have some snow on the passes when we hope to get there in late July, so again, we will be flexible. There will soon be another more extensive route from Andrew Skurka that should be released later this winter. It will probably overlap with much of Dixon and Wilson’s route, but be longer (~100mi) and have some differences that may be preferable for myself and Rockin’. Once we get the maps, we will compare the two and make decisions as to the route we will be taking, which could be a combo of the two. There are also other resources with some great routes, including Nancy Pallister’s off trail guide of the Winds, which is said to be what many of these routes are based off of. Again, there are many options on high routes and none of this is uncharted territory. Just less traveled and more remote. For now, here is a virtual tour I created using Dixon & Wilson’s WRHR route. This tour goes southbound as they describe, but it can be done either way. This will not be our exact route, but is a good idea of what to expect. I think we will be out there a week and a half or more. If you can’t view the embedded video below, here is the direct link to the WRHR virtual tour. Note that the GoogleEarth image for this tour is from July 22, 2014 the first half and June 28, 2014 the second half. Again, this is a route, and that track is there as a visual reference to guide the viewer’s eye along the tour. The Kings Canyon High Basin Route is a newly released route from Andrew Skurka that is also in the Sierra and is comparable to the SHR. It is about 124mi long and should take up to two weeks to complete. Like the SHR, and WRHR, these areas have been explored for decades. Skurka has connected them to create a thru hike. A resource that contains many of the areas that locals may know is Phil Arnot’s High Sierra. There is very little beta on this hike as a thru considering no one has thru hiked it (or published anything about thru hiking it)other than Skurka. I have a feeling many are interested in doing it this summer with the fires last summer preventing many from going out when it was first released. The catch is that this one should be done in late summer with a difficult high water crossing along the route. Personally, this one is a 50/50 maybe on my list for this summer. There are many variables and I will just have to see how I’m doing mentally, physically, and time-wise after the SHR and WRHR. My understanding is that I may be craving more paved trail and mindless hiking after the first two hikes. I completely understand that, but am also intrigued by the KCHBR. Only time will tell how my mind and body deals with so much cross country along talus for multiple weeks. If I choose not to do this hike, I’ll probably head up to the NW and do some summer ones I haven’t had a chance to do in Oregon and Washington. I’m keeping the options open. Here is a virtual tour of the KCHBR I made using Skurka’s mapset and route description. Again, this is a route and has many different options. Already, Skurka has made updates to the original route I have in the tour that he recommends over this original route. It’s fun to watch the tour and I do hope I have the energy and mental stamina to give it a shot at the end of the summer! If you can’t view the embedded video below, (blocked due to copyright of songs in NZ/AUS) here’s the direct link to the KCHBR virtual tour. Note that the GoogleEarth image is from May 30, 2014. Again, this is a route and the given track is there as a guide for the viewer’s eye. The original goal for this year was New Zealand, but I figure that while I’m already out there, I may as well take a month or two to visit Australia and hike two of the most recommended trails over there. It looks like it will fit in perfectly between this summer’s hikes and NZ. I could definitely spend much more time there, but so far, the general plan is to go to Central Australia to tour Uluru & Kings Canyon, and do the Larapinta Trail(139mi). Then head to the west coast to do the Bibbulmun Track (623mi) and Cape to Cape Track(84mi). I know very little about both and will look into them more at a later date, but they come highly recommended and I’m excited to explore Australia a bit. I’M FINALLY GOING TO NEW ZEALAND!!! Those that have been following the blog for awhile know I’ve had New Zealand on my radar for many years. 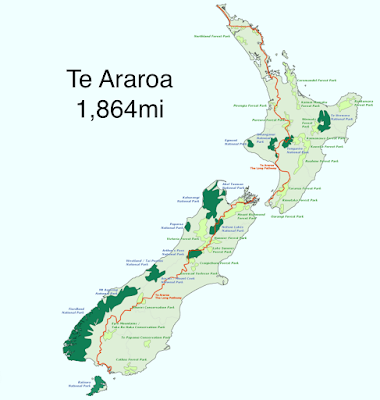 There are many shorter tracks in NZ known as the 9 Great Walks, but the main hike one that people are thru hiking these days is the 1,864mi Te Araroa that runs the full length of NZ. Most hike southbound during New Zealand’s spring and summer. I will probably start in late October for this hike as that is the beginning of New Zealand’s spring. I will not go into great detail on this hike right now, but I will say that the term “trail” is used loosely and that this is a polarizing trail with much bushwhacking and road walking involved along with beach walking, muddy rainforests, and expansive mountains. My friend Why Not is currently hiking it, blogging daily, and having quite the social experience! The TA does not hit some of the highlights of New Zealand and misses some of the Great Walks I might want to hike, so I’m going to take time either as I hike, or for a month or so after, to do some more traveling and sightseeing. I’ll be going into much more detail on this after this summer, but it’s never too late to start planning. If anyone knows a New Zealander interested in helping me out over there, feel free to send them my way. One major goal is that I am looking to rent/borrow a car possibly around the month of Feb/March (2017) for general sightseeing and travel on each island for a month or so. I haven’t looked into details at all and probably won’t for quite awhile. Just excited to get over there and experience it all. I’ll be traveling in Australia and NZ in mid-Nov to mid-Dec tho not backpacking (except virtually with you). Would be a kick to run into you over there but probably a long shot. Happy trails in all your travels this year! Pretty excited about that one!